Very early Friday morning, Tallahassee, FL, where I live, was hit by hurricane Hermine, a category 1 (weak) hurricane. Since then I have heard it described as "devastating," and compared to hurricane Katrina (the 2005 hurricane that leveled immense damage on Louisiana). I have seen pictures of boats tossed up on shore, and houses waist deep in water. I have also heard the question "Why would anyone live in a state that is constantly being destroyed by hurricanes?" While Hermine certainly caused flooding and destruction, I don't feel that the media's depiction of Hermine is consistent with the experience of most of the people that lived through the hurricane. Hurricane destruction tends to be worst right on the coast, and in flood zones, and thats is were the media takes all of their aftermath photos - where the destruction is worst. Most Floridians don't live in those areas. I would like to give a less sensational perspective. Some of the limbs in the yard were pretty large. More than 70,000 people were without electricity, and those with wells (rather than municipal water supply) were without water too (the well pumps need electricity to work). Trees were laying on power lines and across roads. Electric poles had been toppled, and live power lines were laying in the street. The city was projecting that it might take days to restore everyone's power. We ventured out of the house the day after the storm to get some food, and stopped at the first place we came across with power - Walmart. None of their refrigerated or frozen food was for sale - the backup generator to keep the refrigeration going had failed, and a ton of food was wasted. Likely hundreds of thousands of dollars of inventory. We grabbed some food that didn't need cooking or refrigeration and headed straight back home. Refrigerated food goes to waste after power outage. In our neighborhood and around the town we found that the damage from the storm was extremely variable. Some houses looked like they suffered from nothing more than a thunderstorm, and some, like our neighbor's, looked like they had been hit by a hurricane far stronger than Hermine. Some houses looked untouched by the storm. We counted at least 4 fallen trees in this yard. As of this writing it is Monday night, about 4 days after the storm, and 18,000 people are still without power (down from 70,000). Some wells were damaged or are still without power and as a result those residents are still without water. My family was one of the lucky ones - we regained power about 24 hours after the storm, and we are doing fine, but for others, recovery from the storm could take weeks or months. So, was Hermine "devastating"? Should we be comparing it to Katrina? No and no. For a category 1 hurricane Hermine caused a surprising amount of damage. Category 1 hurricanes are not much stronger than tropical storms, which are not much stronger than bad thunderstorms. I expected Hermine to cause the kind of damage that we saw in our own yard - lots of broken and fallen limbs. 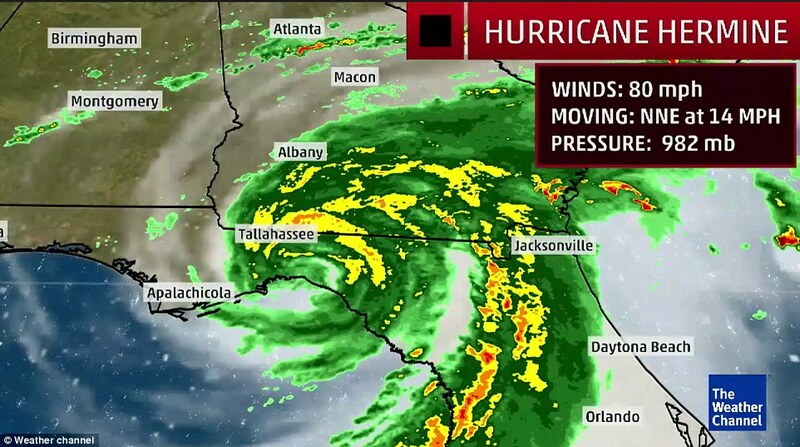 Herman caused a lot more trees and power lines to fall than her category would have suggested, and I believe as a result, we (meaning the residents of Tallahassee) were not as prepared for the extent of the damage as we could have been, and neither was the city itself. That being said, comparing it to Katrina is completely inappropriate - Katrina was truly devastating, it, and the flooding that resulted from it destroyed the homes of thousands of people and came close to destroying one of our country's oldest cities. Hermine knocked down a lot of trees, damaged several homes, and made us lose power for a couple of days. While it will probably take several months for Tallahassee to fully recover from Hermine, the damage from the storm is ultimately temporary. Tropical Storm Colin came through town earlier this week, dumping a ton of rain, and filling the little lake by our house to over flowing. We stopped by the lake on our nightly walk last night, to see how well it had drained in the intervening days, and came upon a surprise. It seems that several little fish that had been living in the lake had been flushed out by the draining water. We discovered them while they were valiantly attempting to swim back up the spillway into the lake, and away from the gaping maws of the blue herons and egrets that laid in wait next to the shallow stream formed by the draining water. The kids immediately sprang to action attempting to return the little fish to the deep waters of the lake. Fire Beard ran back home in search of nets to assist in the rescue attempt. I even got in on the action, but quickly found that the kid's fish rescuing prowess far exceed mine. In the end we rescued about a dozen fish, and hope they are happy back at home. The countertop I had started working on last time is finished and looks really fantastic, but I won’t be talking about it in this post. I really want to do it justice, and just haven’t had enough time this week to do that. I did want to make sure I got in another post this week however, so I will be telling you about the family’s new avatars. Recently I have been working on updating the about page, and realized that it would be nice for my readers to have a mental image of who they are reading about. The problem is that I don’t often show anyone’s face on the blog. That’s because there are a lot of creepy weirdos out there, and I don’t want to make it too easy for them to figure out what me are my kids look like, and do their creepy weirdo thing. Enter the Avatar. An avatar is a symbol or figure that represents someone in a computer game. While this isn’t exactly a computer game, the blog is on a computer, so close enough. Let’s take this one by one. Starting on the left we have Firebeard. Husband, father, and Star Wars droid wrangler? The likeness really isn’t too bad, but I have no idea what is going on here. Perhaps the combination of the superhuman strength and and the hammer imply modern day Thor like abilities but with droids instead of goats. When I asked the kids, they told me, “It's just fun.” At least it is better than the drunken stormtrooper minifig they keep trying to use as his stand in for board games. The little black figure is our Boston Terrier, Earl. I think the food represents what Earl would like to eat, rather than what he does eat, even so, I am glad that clouds of gas are difficult to represent with Lego. Next is me, Gerwerken. My figure is by far the plainest, lacking any outrageous accessory. It looks pretty much like me, except that I rarely wear pants. In one hand I have a coffee cup, and in the other I have the plans for “Taco Tuesday,” which sounds innocent enough, until you realize that in the Lego Movie the Taco Tuesday plan was basically the plan to take over the world, enslave the population, and crush creativity. Was this a subtle hint that they feel crushed under my authoritarian regime, or just a bid for me to make tacos on Tuesdays? When I asked the The boy about it he said, “that's what you need when you work in an office building job.” I’m not sure what that says about office workers. Now the Kids, both of whom are riding dinosaurs. I wanted to know what this might mean psychologically for them so I looked it up. Dinosaurs symbolize the fear of no longer being needed or useful. Perhaps Thomas the Tank engine caused a lot more psychological damage than I realized. The Boy is on the right with the raptors. He is holding a video game controller and a can of soda. While the can of soda is wishful thinking, overall his Avatar is eerily accurate. The Girl is in the middle. She is riding a dilophosaurus (the kind of dino that spits acid in the Lego Jurassic Park game), dressed as a princess, and holding a lightsaber. Somehow, the little plastic figure gives off the impression of leading a marauding horde into battle. So, it’s pretty accurate too. Stay tuned for updates to the about page using our highly accurate avatars, and don’t miss next week’s post on how the countertop turned out – it will be worth it. It has been a rainy Easter today here in the Big Bend. We celebrated with out first ever egg hunt in our new house, our first ever indoor egg hunt, and our first ever game of find the chicken lego man (a game invented by The Boy). I hope your family has also had a great Easter (or a great Sunday if you don't celebrate Easter). If you have some interesting old or new Easter traditions, I would love to hear about them in the comments. Last week I went to Seattle for a conference and Fire Beard tagged along (he had just finished the bar exam and needed a break). Even though I didn't really have nearly enough time to explore the city we had a great time, got to see some of the iconic Seattle sites, and now want to go back to see the rest. Before we left The Boy gave us one of his Lego dinosaurs to keep us company during the trip. 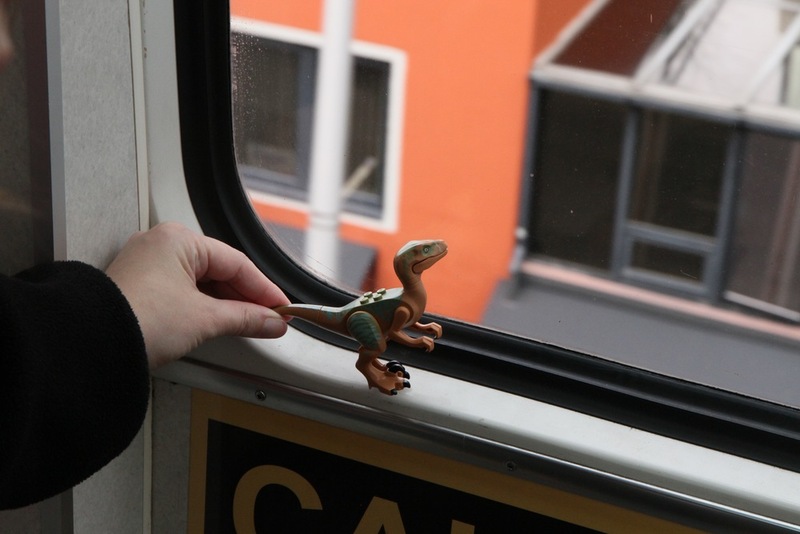 We carried the dinosaur everywhere we went and took pictures of it exploring the city with us. He went to the Space Needle, on the monorail, to the Pike Place Market, and to the first Starbucks. At the first Starbucks we discovered the “You are Here” mug series, and picked up souvenir mugs for the kids (they actually asked for mugs - even kids know that Seattle is the coffee mecca). The Girl got the Seattle mug, and The Boy got the Washington mug. 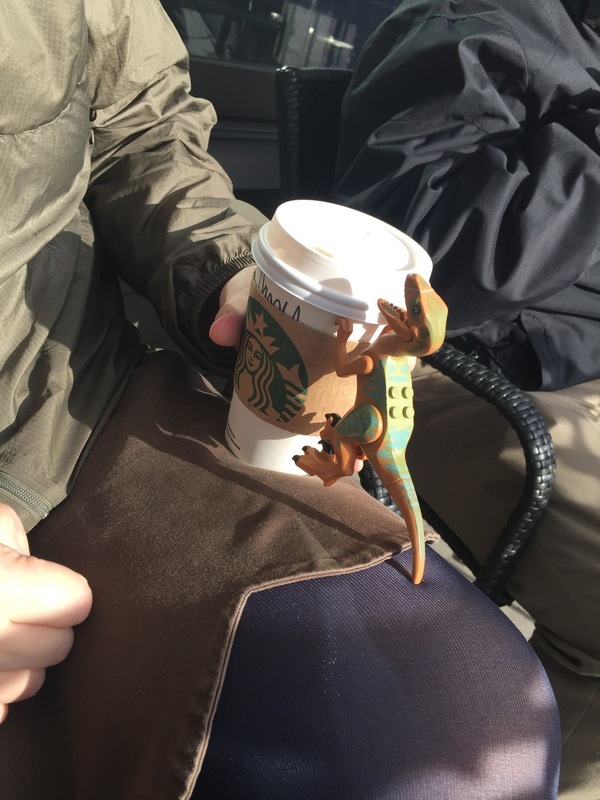 When we got home the kids got their mugs, and the dinosaur was returned to The Boy. After we explained how much the dinosaur enjoyed Seattle and showed him some of the pictures from our trip, The Boy decided that the dinosaur missed Seattle, and made the dinosaur a home in the Seattle mug. That lasted for a few days, until the Lego Space Needle that we had ordered during the trip as a present for The Boy finally showed up. Now the dinosaur is trying to claim a new home - the Space Needle. It’s Saint Patrick’s Day! Here in the US that mostly means wearing green, pinching people that are not wearing green, and drinking! If you are lucky enough to live in an area with an active Irish community, it can also be a great time to learn more about Irish Cultural Heritage. 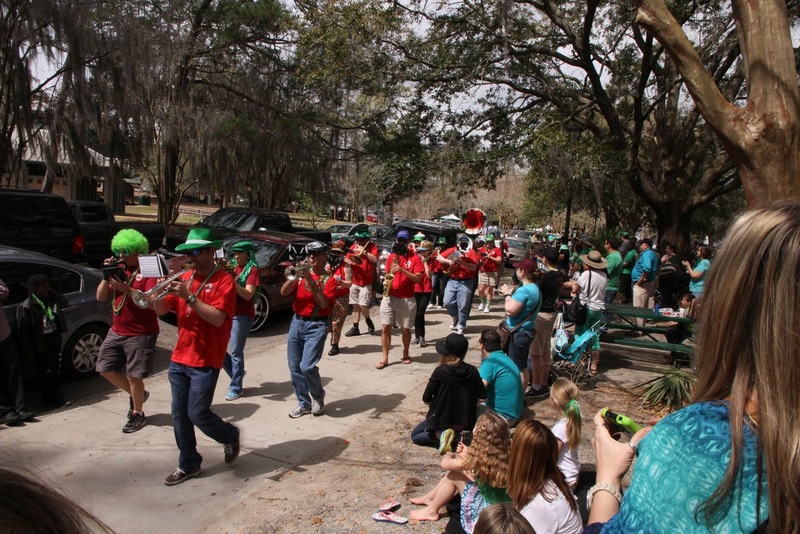 Here in the Tallahassee/Big Bend Area we are lucky to have a small but active Irish community. Every year they put on a Saint Patrick’s Day Parade and Festival. This year the parade was a lot of fun. Even The Boy, who generally hates the large crowds and loud noises inherent in parades, had a great time. That is probably because the Saint Patrick’s Day parade is a rather more intimate affair than most parades. 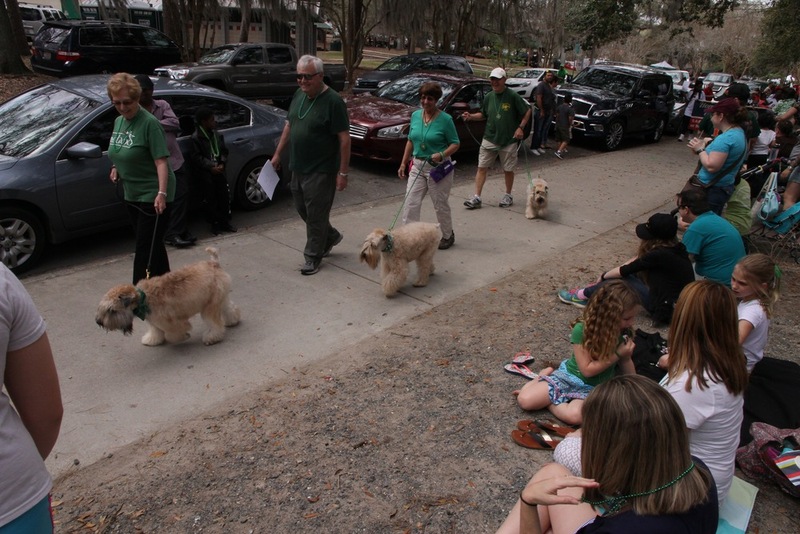 The Saint Patrick’s Day parade is not a big parade by any means. There are not a lot of people in the actual parade, and there are not huge crowds attending. From beginning to end the parade took less than 5 minutes to pass by us, and took at most 30 minutes to make the entire 0.6 mile circuit around Lake Ella. The people in the parade that hand out candy and necklaces to the kids were able to literally hand out candy and necklaces to the kids rather than throwing it in the general direction of the kids in the crowd, and everyone was very friendly. Generally my kids want to go back home as soon as a parade is over, so I was pleasantly surprised when they asked to stay longer. We made our own circuit around the lake before we left, exploring the stands and booths set up for the festival along the way. But today is Saint Patrick’s Day, which requires some celebration. If you are staring a pint of green beer in the face, and feeling a bit green yourself, I would like to offer an alternative; The Grasshopper. The Grasshopper is a mint chocolate flavored, green colored cocktail, that probably originated in New Orleans. It tastes a bit like melted mint chocolate chip ice-cream, and is really good! Around mid December last year in the midst of many family friendly holiday actives, I began lamenting that similar activities did not happen more often the rest of the year. The Tallahassee / Big Bend Area of Florida where I live is a great place for College students and young adults without children to find fun things to do (there are numerous events, bars, clubs, and shows catering specifically to them), but if you are a young to middle age adult with babies or school age children it can be hard to find things to do. I decided that my New Year's resolution would be to find more community activities that my family could participate it, and enjoy the community I live in more. Then soon after Christmas I started feeling poorly and promptly forgot about my resolution. Now 2 months, many doctors visits, and the miracles of modern medicine later, I am feeling much better, and am ready to start my resolution. I began by trying to find actives for my own family to participate in. I wanted to find things that looked fun or educational, didn't cost an arm and a leg, and were not being held on a school night. 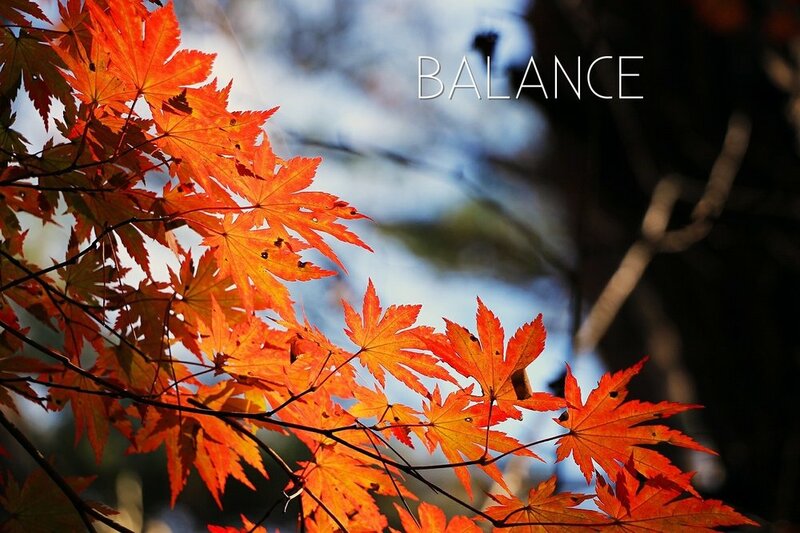 As I found things to do, I realized that other families were probably struggling with the same problem, and decided to post what I found online in the hope that other families could benefit as well. All the events that I find will be posted on the new Community Calendar page linked to from the Gerwerken Crafts Main Page. 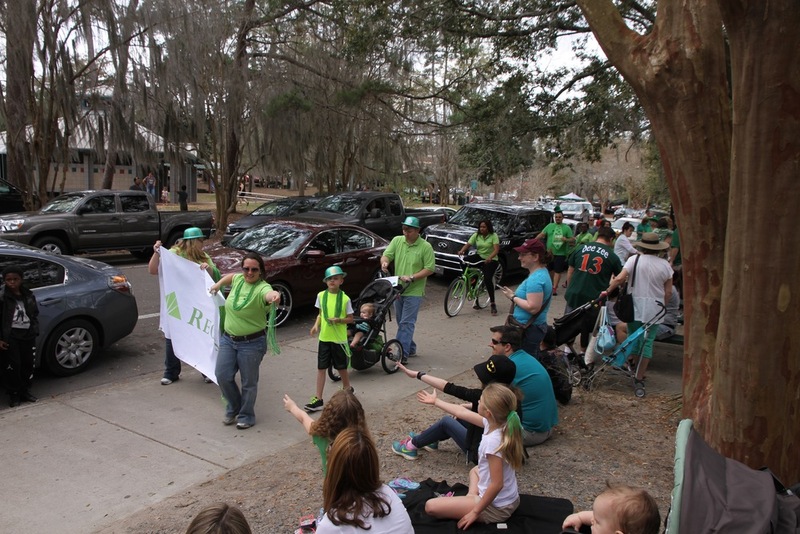 So far there are two events, The Saint Patrick's Day Parade and Festival being held this weekend, and the North Florida Veg Fest being held next weekend. You can see additional details on the calendar page. If you know of an event that you would like to see on the calendar please tell me about it, but keep and mind that I am not listing all community events, just those that fit my criteria. So, what does it take for an event to be on the calendar? It must be either an event it would be appropriate to take a school aged or younger child to, or a date night event. It can't be held on a school night. It needs to cost no more than $20 for my family of 4 to attend (I might occasionally bump that up to $50 if something really amazing is happening. It has to be something I would take my family to (I know, this one is really subjective, but I hope you like my choices). On an unrelated note, you might notice a few changes to the Gerwerken Crafts website now, and in the near future. I was hoping to finish them all prior to the calendar going live, but decided that getting this weekend's event out was more important. Playa is a lake again! We have a Lake Again! About 2 months ago I told you how our neighborhood lake had dried up, leaving us with a playa, or dry lake bed. The playa wasn't bad, the kids enjoyed playing on it, but we missed our lake. Then about a week ago it started raining. It rained for 3 days and 3 nights (thanks hurricane season), and at the end we had a lake again. Then as we were driving by on Saturday, I saw something I didn't think I would ever see in this lake, Kayakers! I actually jumped out of the car to take these with my phone before they got too far away to see (sorry they are not the highest quality). So far the lake only has a couple of feet of water, but we should be getting some more water later this week. Hopefully soon, the lake will be back to it's former glory. When we moved into our new neighborhood in April we were excited about the lake. It was a big beautiful lake that stretched into the distance in a rather mysterious way, making it hard to tell just how big it was. I made it a point to drive by it on the way to and from work, because it made me smile whenever I saw it. And after dinner we would walk down to it to watch the birds. At the time the rain fed lake overflowed it bounds, creating a little creek that wound around the neighborhood. Ducklings were born, tadpoles turned into tiny frogs, and we looked forward to a long summer enjoying the lake. Then the wet Spring turned into a dry summer, and the lake began to shrink. It is not strange for shallow lakes here to lose some of their water to evaporation in the heat, and we have a large lake nearby that drains periodically when the local aquafir is running a bit low, so we were not that worried. After all, summer is hurricane season, surely we would soon have a big storm that would rain for days filling our little lake back up. More birds came enjoying the shallow water and easy access to snails. We even got some rare birds for the area like spoonbills. It was still beautiful in its diminished state, and the birds made up for the lack of water. Now it is almost fall, Hurricane season will be over soon, and our lake is empty. I continued to drive by to and from work, and we continued to walk down after dinner, but the snails and the birds are all gone, except for the occasional vulture. The weeds are several feet tall in some areas, and where they do not grow the soil is dry and cracked like a desert. Our neighbors seem unconcerned. It has, as they point out, been a very dry summer. We still have hope that our lake will fill back up, but if it doesn't, we will still have a nice playa to play in. At the beginning of the summer as the temperature rises, the native Floridians prepare to hibernate in their climate controlled dens for the summer.Knowing that going out in such high temperatures can cause severe burns, incite violence, and completely stop the brain from functioning, the native Floridians turn down the air conditioner, pull the blinds closed, and prepare to avoid the sun as much as possible for the next several months. As fall approaches the Floridan begins to stir.Since the temperature does not change in their climate controlled dens, it is not clear what lets the Floridan know that fall is approaching.Perhaps they can tell based on subtle signs, such as the the snow birds returning from their annual migration, or the proliferation of pumpkin spiced everything.What we do know, is that the Floridians emerge from their caves every year on labor day weekend.If that that time the Floridian begins to sweat, it is said that summer will last another 6 weeks, but if the Floridian doesn’t sweat, legend says that Fall will come early. We had a high of only 81 F today, and we are forecasted to have a day this week with a low in the 50s. That is unprecedented. I don't remember the last time it felt cool outside before October....ever. It is amazing. I'm actually sitting outside today writing this. My kids even willingly went outside to play today. I think that may be the first time they have willingly gone outside to play without water involved since we moved into this house in April. We decided to put up a temporary play area for them out of a sun sail and table and chairs to encourage them to go out a bit more, and so far it is working! We originally got the sun sail from Ikea to block out the horrible light of the day star, but began to melt during our original attempt to put it up, so it has been in the hall closet ever since. It made a great little lean to type structure for the kids to play under. If you have any suggestions for outdoor activities that won't cost an arm and a leg, that big kids would like, please leave a note in the comments. I would love to hear your suggestions! We have a new House! The new house (From the original listing). This Saturday the girl ran her first 5k. She ran with Fire Beard, in the pouring rain, and loved every minute of it. I was very proud, from the top of my head to the tips of my wet frozen toes. Seriously though, it was miserable out there. I stayed cold for hours after we left, and we didn’t even stay for the big Christmas parade after the race. I was shocked and proud when she came over the finish line with a smile on her face, and told me she wanted to do it again next year. I guess the girl is one tough cookie! St Nicholas Day is a children's holiday celebrated on December 6th throughout much of northern Europe. It is celebrated in memory of Saint Nicholas who was known for his generosity and gave treats to poor children around Christmas Time. On the night of December 5, kids leave their shoes out for St Nick. If they have been good, they will wake to find little presents St Nick has left in their shoes. Often these presents are candy, or small toys. My family has never celebrated St Nicholas Day before, (and neither has the vast majority of Americans from what I can tell), but we did this year. On December 5th my kids left their shoes out, and the hope that I would fill their shoes with treats if they were good (they were). October 2002 was a good month. Grad school was going well, Firebeard and I went on our first date, and Surly was born. However, I wouldn't know about Surly's birth for 4 more months. It was February 2003 when I first met Surly. He was a skinny puppy, being bullied by the other dogs at the pound when I decided to take hime home and keep him safe. He had already had a hard life. Surly had been removed from the home of his previous owner because he had been badly neglected. When I got him he was 15 pounds, and the pound informed me that he had been only 7 pounds when they received him. He was up to 30 pounds about a month after I took him home. Despite his early malnutrition, Surly was never food aggressive, however, he did eat a few odd things early on. Very soon after I brought him home he decided to ingest a large christmas light bulb, and a steal wool pad. I thought he was a goner, but he was absolutely fine. I would say that it didn't effect him at all, but he never ate non food items after that incident. Surly and I did a lot together those first few years. When I rode my bike he ran after me, when I went swimming he jumped in too, and when I layer down he snuggled with me. Then in February of 2005 he started acting strange. He seemed depressed, and didn't want to snuggle with me like he used to. Instead of crawling on me to get to a good spot on the couch, he carefully avoided crawling on me. After about a month of this strange behavior I had decided to take him to the vet, when suddenly his behavior made sense. I was pregnant with the girl, and he had been carefully avoiding my stomach the entire time. I never had to worry about Surly when we took the girl home from the hospital. He immediately included her into his pack. He carefully watched over her during the day, alerting me when she woke up or lost he pacifier, and at night he slept in the hall between our rooms. As the kids grew Surly watched over them, and tolerated everything they did to him. He even protected the other animals in our household. I was a bit worried about what he might do when we brought chicks home, but I need not have been. He watched over the chicks just like he had the children, herding them to safety, and even protected them from other dogs. It was around July 2012 when we found out he was sick. He had a lump in his throat, a large lump, that we knew was cancer even before the vet confirmed it. He had late stage lymphoma, that had spread all over his body. The vet didn't expect him to live more than a month. We immediately started feeding him whatever he wanted, not expecting him to live long enough for there to be consequences. Firebeard left for school about a month later, with Surly still alive, and me expecting a quick decline. The decline didn't come, at least not right away. For months he was his normal self, not needing the steroids the vet had given him, and getting fatter from all the extra food instead of thinner from the cancer. He slept in the kids bedroom, watching over him at night, and stood guard during the day as they played in the yard. Eventually he needed the steroids. He started sleeping more, and slowed down. At the end he developed type 2 diabetes, and had difficulty eating. He lived a year after his diagnosis. If you were part of Surly's life, and would like to leave a comment or story about him I would appreciate it. I hope you all had a wonderful July 4th. Here are some pics from our celebration. The mountain cabin is nestled into the side of a mountain, fairly high up, but not at the top. While it is not a big house, it is very comfy with its wooden floor and ceiling, over stuffed couch, and it’s wide back deck looking over a sea of wild flowers and Irises. My favorite thing to do at the cabin is sit in a rocker by the fireplace and read or knit while a fire crackles merrily in the grate. If we are feeling ambitious we hike up the nearby Whiteside Mountain. The mountain is considered one of the best climbing areas in the southeast with its uninterrupted sheer cliff faces, but it also has an easy hiking trail to the peek. In recent years, handrails have been added or repaired so that the access to the cliff face is more limited, but it is still possible to hike to the very edge in some spots. About this time last month was my 9 year Wedding Anniversary. Fire Beard and I were finally able to celebrate on memorial day weekend. We took a trip up to the family cabin in North Carolina, and had a wonderful time. We took my old dog with us, knowing it might be his last trip since he has late stage lymphoma. I don't think anyone would have guessed he is ill. He seems to have forgotten himself. We spent nearly every evening at the dock near the cabin, throwing sticks into the water for the old dog to fetch. He is not as buoyant as he used to be, but he didn't seem to mind.